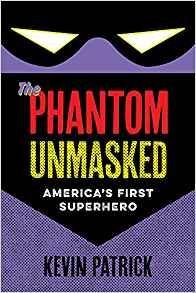 You are here: Home » MEDIA » Books » The Phantom Unmasked: America’s First Superhero by Kevin Patrick (book review). The Phantom Unmasked: America’s First Superhero by Kevin Patrick (book review). I thought with Kevin Patrick’s book, ‘The Phantom Unmasked: America’s First Superhero’, I would be on home territory. I even wrote an article about ‘The Ghost Who Walks’ back in my comic fandom days pointing out how much the Batman was an urban version of him, more so as the Phantom pre-dates him by three years. It was then a little curious as to why Patrick would draw attention and comparison to Superman, as the two characters aren’t alike in power or disguise. Patrick only goes into the Batman comparison much further into the book. Even so, I agree that creator Lee Falk borrowed the ring idea off the Shadow. It seems traditional to borrow something that works. Then again, every hero has to leave their mark somehow. I do wonder with the number of fights, why the Phantom’s enemies don’t have more than one skull mark on their heads after fights. There’s a lot of info that I wasn’t aware of before in this book making this a useful tome. The Phantom was originally supposed to be in grey but when colour was introduced, his togs ended up in purple. Considering thirty years down the line, a certain Incredible Hulk had a problem staying a consistent grey, I do wonder if that was a similar reason for the change with the Phantom. I knew the Phantom is still popular in Australia but didn’t know about Sweden and India until later in the book, Patrick points out how Bengali or, later, Bangalla is moved closer to each of these lands with a few script tweaks although he doesn’t see it as the means to make the kinship. This does explain the movement of the country as I noted in a review a couple months back. Interestingly, in these countries, the Phantom’s newspaper strip was put in an Australian women’s magazine which changed the target audience somewhat before getting their husbands interested. In many respects, the Phantom living in his own country, in much the same way as Tarzan in his form of Africa, ensured his continual existence when comicbook sales slumped in the 1950s as neither were really entrapped in any particular time period. Indeed, the Phantom did something of a reverse, moving from being a newspaper strip into novels that I’ve discovered are currently being reprinted in the USA. The life of the 21st Phantom is very much linked to the adventurous Diana Palmer, whom he does actually one day marry. The first Phantom’s real name is revealed as Sir Christopher Standish so he’s British as well, taking the title of his dead father when they were set upon by pirates, although this was later revised into being a freedom fighter against slavery. Whether creator Lee Falk realised it or not, this makes the first super-hero British by extraction. The eldest son of each generation then becomes the next Phantom, propagating the legend that he never dies. It does leave a few unanswered questions of just how does each Phantom’s family actually grows and what happens to the rest of the childrem, more so as there was even a female Phantom a few generations ago when their father was injured. There’s a lot more detail than this but a lot of it is sticking in my memory. Something I hadn’t known before was the names of the Phantom and Diana’s twins. Kit was pretty obvious, it seems to be a tradition as well and his sister is named Heloise. The more in-depth look at Australia, Sweden and India’s approach to comicbooks back in the 1950s, especially regarding childhood delinquency makes Frederic Wertham’s views look mild in comparison and explains why their home markets in comicbooks took a while to take off. All three countries wanted wholesome comics for their kids and only the Phantom was seen as having that quality. In India, the Phantom was considered more wholesome than Superman. Interestingly, Australia was similar to the UK in that it received American comics when ships used them as ballast. Of course, with a smaller market, all three countries lost sales when more homes had television sets. If you are a Phantom completest, that fact that all three countries had creators who also wrote their own adventures will mean some tracking to get them all, although they did do the traditional 7 year recycle for those who missed the first time so there are multiple reprints. Oh, something that comes out in the footnotes about the Phantom’s trunks in Sweden being switched from purple and black to red and black was more to do with the contrast to the rest of his costume than for any other reason. It’s a shame more time isn’t spent with the Phantom in other media. I watched the 1943 ‘The Phantom’ cinema serial starring Tom Tyler a few years ago and, considering its budget, it did hold up rather well. The Billy Zane starring 1996 film ‘The Phantom’ obviously did better in Australia than the rest of the world. Can I give a personal recommendation that after you’ve read this book that you watch the film as it’s a reasonably faithful adaptation and I was forever noting what was used from the comic-strip as it came up in this book. Although the actual Internet survey is only an appendix at the back of the book, we see the results as Patrick examines the appeal of the Phantom across the world, omitting the USA and the UK. For the British, I can understand that to some extent as apart from a few brief appearances in British comics in the late 1960s and early 1970s, other than a brief run in DC Comics, the Phantom’s presence here is kind of sparse. Essentially, the Phantom is seen as a good role model but you should read that for yourself. About the only merchandise Patrick doesn’t mention is the Phantom being used as one of the costumes for the American Captain Action figure back in the late 1960s and those adverts were probably my first time at seeing him. In some respects, Kevin Patrick’s book has too much emphasis on the fan effect of the Phantom and I would have liked to have known about the character. There are hints that Sweden did do stories about the earlier generations of Phantom. It would have been nice had the book contained pictures from the comic-strips and such to supplement the text but copyright issues might have made that expensive. Even so, if you didn’t know much about the Phantom before, then you will so after this book. The big plus is getting some insight into three other countries who took the Phantom to their hearts. I just purchased a copy of the book a few days ago. « Anne Charnock wins Arthur C. Clarke Award for Amazon’s 47North.